The Kodak Retina IIIC enjoys the reputation as one of Kodak's most collectible cameras. Many consider it the best of all folding 35's. Now to be fair about it, or almost fair, the 1959 Retina IIIC is the last of a long line of folding Kodak 35's which began in 1934 and had the honor of introducing Photography to the now standard 35 mm cartridge. Some people like the IIIC because it was the last and most feature laden of the line. The IIIC is also the largest, most complicated of the lot. Like the other Retinas of the late 50's, it has the reputation of an overly complicated internal construction. Many repairmen refuse to work on them. By far the IIIC is also the highest priced folding Retina in today's collector market. In 1996 when the exchange rate was 100 Yen to the dollar, incredulous US camera dealers happily sold perfect Mint IIIC's to the Japanese market for $1000. The IIIC's claim to fame is its best (for Retina) projected line parallax corrected finder with built in framelines for its limited lineup of 35, 50 and 80 lenses. Alas, a M Leica it ain't. All frames are visible all the time, giving a cluttered feeling. Worse, the finder or rangefinder spot are not all that bright. It also has a tendency to collect flare over the years. While the the IIIC's finder great looks compared to the squinty little finders of previous Retinas, it palls in comparison to its contemporaries from Leica, Nikon, or Canon. This pic shows shows the front element of the 50/2 lens removed. Front element? Yep, that's right. The Retina doesn't feature true interchangeable lenses, rather true interchangeable FRONT elements. It makes for a more compact camera. It also makes for some optical compromises and some ridiculously LARGE SLOW wide and tele lenses. To remove the a front lens component, all you do is rotate it counter clock-wise. It clicks right in or out. IMPORTANT: Notice the two sets of serial numbers. These MUST match for you to have a properly working 50 mm lens. IF they don't, some SOB has switched them and the camera is useless until you have a repairman install a new matched pair of front and back elements into the camera. What's this? Would you believe a 35mm wide-angle? Note its incredible size, for a slow 35/4 optic!! Even worse, this baby is NOT rangefinder coupled!! You have to first focus the 50 mm rangefinder, get a footage figure, then transfer that figure to the wide or tele lens! Are you really desperate enough for lens choices to tolerate this? I hope not. The next issue is compact size. The entire reason for a folder is SIZE. 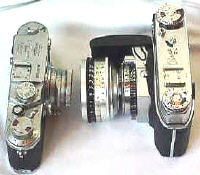 Yet, as the pics below show, the IIIC is larger than its contemporary Leica IIIf with collapsed 50/2 Summitar. It is MUCH larger than a Leica IIIf with a 35 wide angle! What's going on here? 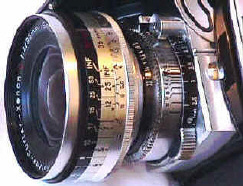 With the standard 50/2 lens, the IIIC weighs 1 lb. 17 oz, Vs 1 lb. 16 oz for the Leica! Small yes, but why not smaller?? The next thing I don't like about it, or most of the later Retinas, is their STRANGE controls. Left to right. OK, the rewind knob is not so strange. But what about that strange manually setting film counter? You have to push down on that little button beside the counter, while you push that button on the backside of the top plate (visible barely from the top view). The counter counts backwards, showing you how many shots you have left. This is a late IIIC with the 3200 ASA dial setting. Also notice the arrow direction next to the rewind knob, also a late IIIC feature. The meter is NOT coupled, and simply shows the LVS value to set the camera too. LVS value? It's a pain, set up for idiots too lazy to learn f/stops and shutter speeds. We are now looking at the bottom of the camera. To open the back, turn that in the direction of that little arrow around the tripod socket. Underneath you will find not an Easter Egg, but a little button which you push to open the back. 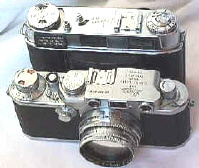 To the left is the bottom mounted film advance and shutter cocking lever. It's actually convenient, but takes some getting used to. That button is the film rewind button, but also unlocks the film advance. 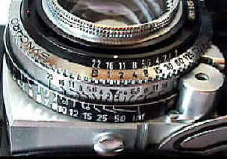 When you get to the last exposure, the shutter and advance lock until the film counter is set back. You do that with the above mention methods, plus pushing in on the film rewind button. Note the soft aluminum advance lever which scars so easily. OK folks, words may fail me here in this gadgeteer's paradise, but I will give it a shot. These two pics show the lens/shutter assembly from the top and bottom views. Left pic, working down to up. Notice that large button near the bottom edge of the picture, and another one in the other picture. Those are the locking buttons for the lens. To retract the lens 1) make sure the lens in at the infinity focus 2) push those little buttons in 3) close the door. Still on the left pic, work up and notice the focusing scale and the depth of field indicator. Above that are the shutter speeds 1 to 1/500 and the f/stops 2 to 22. Right pic shows the focusing lever on the right corner of the photo. It has to be in this infinity position for the camera to close. Above that is the loathed LVS system. It locks the shutter speeds and f/stops together at the pre-selected light value, so they move together--when you move to a larger f/stop, the shutter speed automatically shifts to a higher speed too. This system may be fine while you are taking pics in the same conditions, but as light conditions change and you want to adjust exposure, this extra step really becomes a nuisance. If you plan to shoot your Big C, I suggest removing that LVS lock. To the left notice the PC connection. It thoughtfully aims the PC connector straight down so it can fall of more quickly and easily. The LVS system locks the shutter and aperture into combination which moves together. Thus changing one automatically changes the other. The LVS scale and lock are not so conveniently found on the bottom side of the shutter. 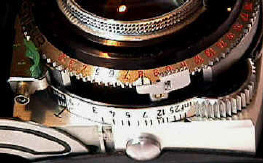 Also note the focusing lever, which MUST be at the infinity position for the lens to collapse. Better 35 folders? I personally find both the Zeiss Contessa and the Voigtlander Vitessa much better made and well finished cameras. Compact? The Zeiss Contessa has the Retina IIIC beat in compactness, weight, finer finish, construction quality, and price. Contessas currently sell for about half of the IIIC price. So why get a IIIC? While the Retina IIIC is not on my list of favorite cameras, it does have admirers, visit them at http://www.netins.net/showcase/crye/retina.htm and http://user.itl.net/~kypfer/intro.htm. I will agree that the IIIC is a fine picture taker. The problem is that there are far better choices....especially for the money.